It's the Hubby's birthday this week! He turns the big 3-0! So many wonderful surprises and so many wonderful presents have been revealed. Now that it is all wrapped up, I can finally share the exciting celebrations. It was supposed to start with a trip to San Francisco to taste the exceptional Pliny the Younger at Russian River Brewing Company. The weather Gods had other plans for us though and dumped several inches of snow on Raleigh, preventing us from getting out there. So that was a HUGE disappointment, but we are already planning to go out next year. Like a mature, almost-30-year-old, the Hubby lifted his spirits and moved on. What he didn't know is that I had a very large surprise party planned for him the following weekend! Friends and family gathered at his favorite craft beer store, Bottle Revolution, to surprise the hell out of him. Needless to say, it was a success! The celebration continued with a new coffee setup for the Hubby the morning of his birthday. You haven't tasted a great cup of coffee until you have had a pour-over using Counter Culture beans! It has started our mornings off right this week! Back to the focus of birthdays, the cake. Hubby had not just one cake this year, but two! 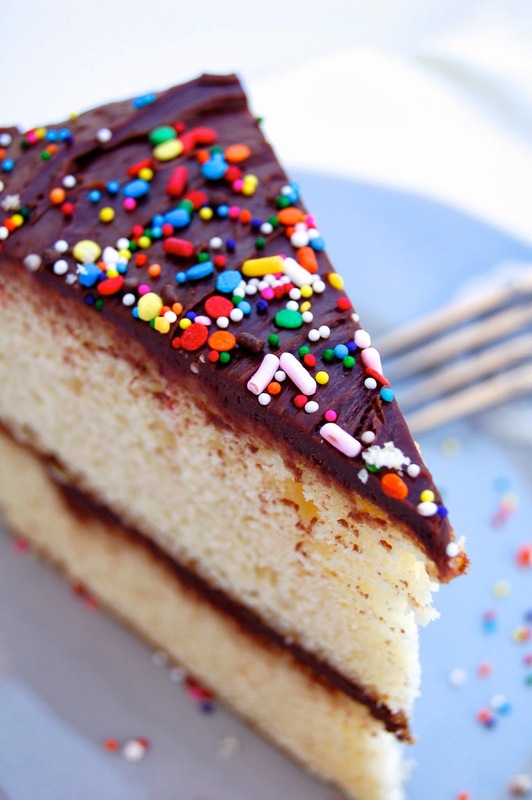 I have been with the Hubby for 10 birthdays now and for each one, he always gets a yellow cake with chocolate frosting. He loves it. And yes, we have used the box kind forever and it works perfectly. BUT, since I have a food blog, I couldn't cheat this year, I had to make it from scratch. I had a little help from The Vintage Mixer and whipped this up after I found out our trip to San Fran was canceled. I thought a little yellow cake with chocolate frosting would cheer him up! Then, for his surprise party, his mom took some inspiration from one of my favorite bloggers, The Beeroness and made an Epic Chocolate Stout Cake with Chocolate Bourbon Sour Cream Frosting. Amazing! This cake was a huge hit at the party and absolutely one of the best cakes I have ever eaten. 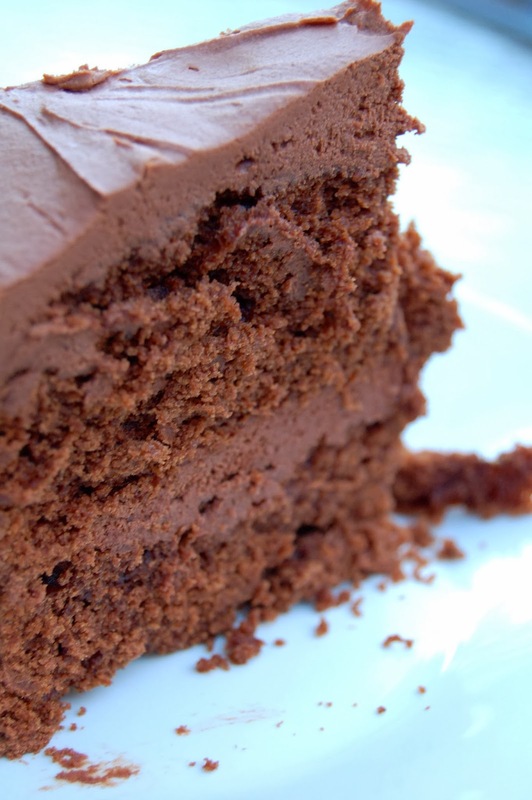 Rich, chocolaty, bourbon-y and moist. 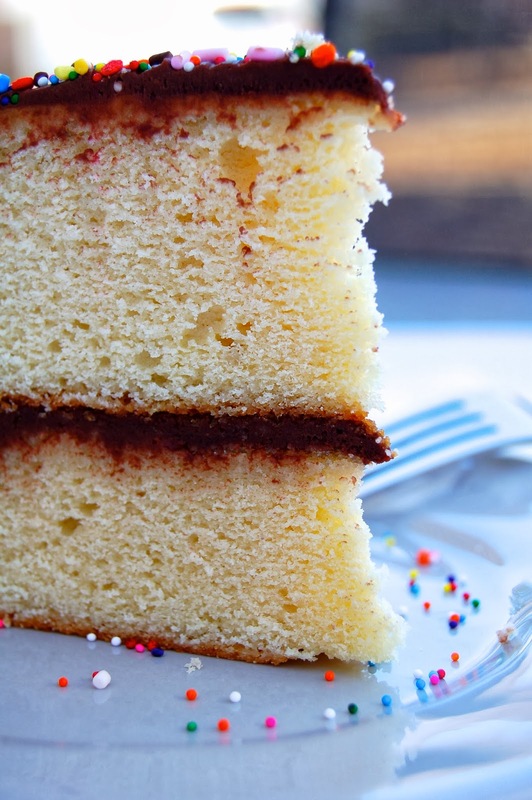 The celebrations will continue for a few more weeks with more family dinners and birthday cards, but we wanted to share the recipes for the birthday cakes we are enjoying this week. The Hubby deserves the best birthday, that is for sure! 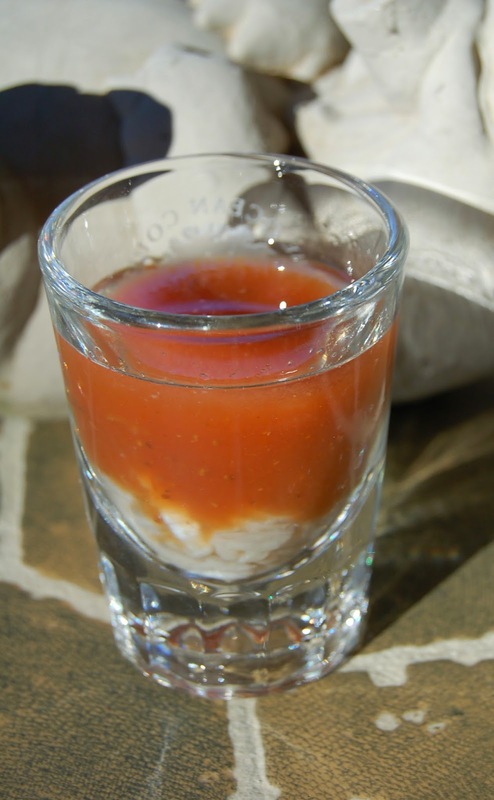 The Oyster Shooter is one that I obviously didn't try until later in my life (after 21), but one that I look forward to on holidays or family special occasions. I realize that many people don't like oysters, that they are an acquired taste, that they are an aphrodisiac....blah blah blah! That's all ok with me, but I will tell you that if you like Bloody Mary's and you like oysters, then try this combination - you will love it. I am partial to fresh oysters, but sometimes Whole Foods has some decent ones in a jar at the seafood counter. However, there is nothing like a fresh oyster pried open with your own hands. I know it might be random to post this drink at the end of February, but I just couldn't help myself, especially as oyster season comes to an end. I love them, my family eats (and drinks) a lot of them. They are little treasures from the sea. So enjoy this little treasure, from my family to yours! Bottoms up! Life gets crazy and Hubby and I do our best to keep up with everything. Even though we both work a lot and are very committed to our jobs, there is always something that is more important to us - date nights. In light of Valentine's Day sneaking up, we thought this was the perfect romantic recipe to share! When it comes to this Hallmark holiday, we like to stay in and cook together. This risotto is the perfect recipe for two people because it requires several steps and a lot of attention. Risotto is a labor of love, in every sense of the phrase! 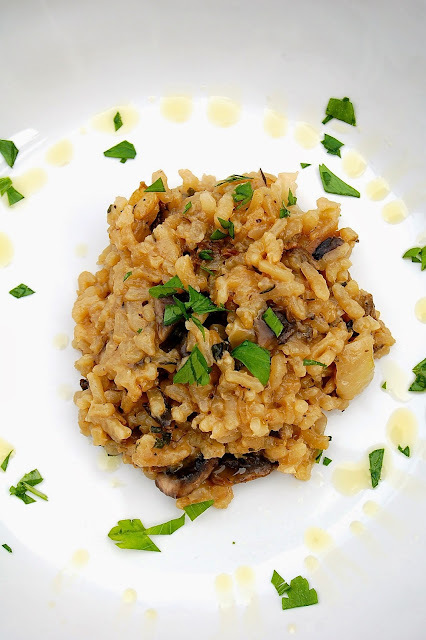 For those still wondering what to do to Wow your loved one on Valentine's Day - make this Wild Mushroom Risotto. If rice isn't enough for you, then add a sautéed or grilled meat/seafood on top. If you really want to get decadent, throw on a lobster tail. This recipe is at the top of the decadent date night list for sure - perfect for Valentine's Day! The way to a man's heart is through his stomach. Happy Valentine's to my sweet Hubby. Re-hydrate the mushrooms according to the package. Remove the rehydrated mushrooms and reserve the liquid and keep warm next to the chicken broth. While the mushrooms are rehydrating, chop all your ingredients. Heat 1 tablespoon of oil in a large skillet over medium heat. Add 1/4 onion and 1 clove garlic, cook, stirring, until translucent, about 5 minutes. Add the fresh mushrooms, herbs and butter. Sauté for 3 to 5 minutes until lightly browned, season with salt and pepper. Drizzle in truffle oil then add the rehydrated porcini mushrooms. Season again with salt and pepper. Cook for 1 minute then remove from heat and set aside. Coat a large saucepan with the remaining oil and sauté the remaining 1/4 onion and garlic clove for 2 minutes. Add the rice and stir quickly until it is well-coated and opaque for about 1 minute. (This step cooks the starchy coating and prevents the grains from sticking) Stir in wine and cook until it is nearly all evaporated. With a ladle, add 1 cup of the warm broth and cook, stirring constantly, until the rice has absorbed the liquid. Add the remaining broth, 1 cup at a time and stir until the liquid has absorbed down. Continue to cook and stir, allowing the rice to absorb each addition of broth before adding more. The risotto should be slightly firm and creamy, not mushy. Once the rice has thickened and all the liquid has been used, taste the risotto to make sure the rice is cooked through. If not, heat water or broth in the microwave and stir into the risotto in a similar fashion as prior steps. When the risotto is to a desired consistency, stir in the mushroom mixture and Parmesan cheese. Stir this until the cheese melts and the result is a creamy, thick risotto. Top with a drizzle of truffle oil, chopped parsley and bacon or meat if using. I am feeling empowered! I finally have my normal routine back. Well mostly. This broken foot situation pretty much put my life on hold for 2 months and continues to do so. I am proud to say I am finally out of the boot! I can drive myself to work, I can cook dinner and can finally start exercising again! I feel empowered! The feeling only grew when I heard "I'm Every Woman" by Whitney Houston on the radio. When I have this feeling, I love to eat healthy. And what is healthier than making a fresh juice? I have an older juicer, but one that still does the trick. I made this juice when I was doing my Fall Cleanse and it gave me the energy boost that I needed in the morning, especially since caffeine wasn't allowed. 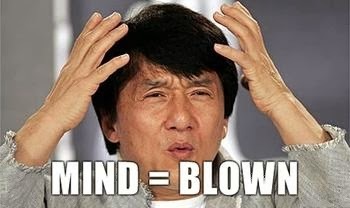 Ever since the cleanse, I have decreased my caffeine intake immensely, not relying on it to wake me up in the morning. Instead I make juice when I have the time, which always starts my day off well. Oftentimes I make a large batch on Sunday night for the start of the week. "They" say this isn't the correct way to juice. But seriously, who is "they" and how do they have the time to juice all day, every day! So, I am here to tell you that you can juice a day in advance. Don't let the greens in this juice scare you, the apple pulls it all together nicely, masking the bitterness of the kale and punch of the fennel. I know that not everyone has a juicer, but if you do, I highly recommend this blend. The apple provides multiple health benefits, while the fennel is a natural antioxidant and immune system booster. 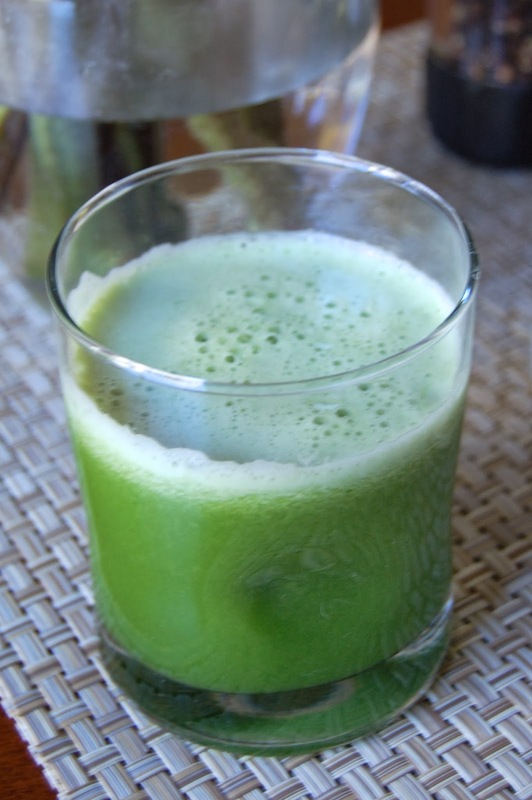 All around, this juice has wonderful flavors and more importantly, wonderful health benefits. Place all the ingredients into a high speed juicer and enjoy right away or store in an air tight container for up to 24 hours. 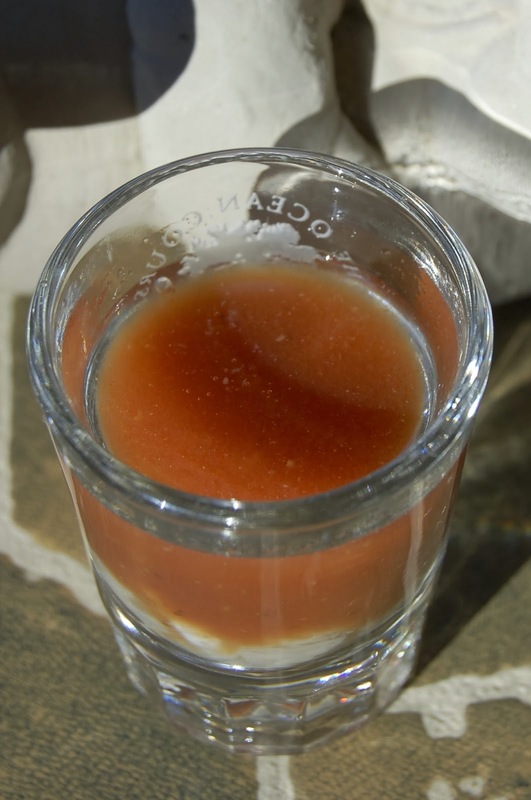 The juice starts to loose the essential enzymes after a day, but still tastes delicious! There are so many things to report today!! Happy Birthday to my little brother! Congrats to my big brother on the new job! 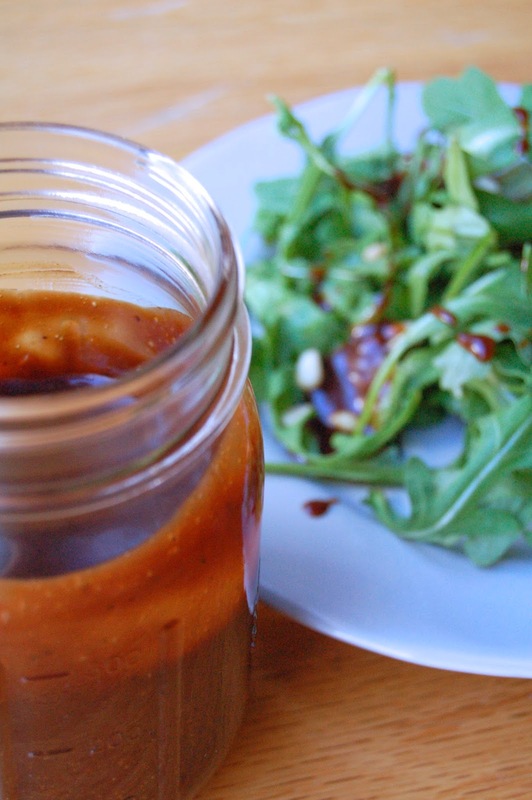 And, I've got a recipe for the only salad dressing recipe you will ever need! Paul, my "little" brother, turns 24 today. I haven't known him my whole life, but I do consider him a full-on brother. You know, one that you can tease and give life lessons to at the same time. I am so happy to have him in my life and hope that I live up to "the-big-sister-he-never-had" title. My older brother got a promotion! So proud of him and all his hard work, although it does mean that he is moving away, but I know this will be a great position for him. I will miss having you close by bro! There is a lot of family love going on around our house today. It is only appropriate that I keep that going with the recipe. This salad dressing recipe goes back to the first time I met the Hubby's parents, which was actually before we were officially dating. I went to their house for dinner and instantly fell in love with his Mom. First of all, she had an amazing meal planned and she was preparing everything while talking to me at the same time. I could tell this woman knew her way around the kitchen, and very well! I can't remember exactly what she served, but I know it involved surf and turf and a side salad. Side salads are often served with dinner in her kitchen, which I love, and she usually has a few dressing options. One of which is her Balsamic Dressing, made from scratch! That was the moment when everything changed for me - this salad dressing. I have made this dressing numerous times since this recipe was handed to me. When I make dinner for friends or new moms, I always include a jar. It is the perfect combination of tangy and sweet, it keeps in the fridge very well, and is SUPER easy to make. This recipe is definitely worthy of the expensive oil and vinegar! Whisk the first seven ingredients together until blended, then gradually pour in the olive oil while whisking to emulsify. I prefer to do this by hand, but this can easily be made in a blender or food processor - blend first 7 ingredients until combined and while the blade is running, add in the oil. This dressing will keep in the refrigerator well, but becomes slightly firm, so bring to room temperature before serving. I usually can't wait that long, so just spoon it on my salad and mix around. Or you can heat in the microwave for a few seconds.